You do have amazing timing. R.I.P. Frank Robinson. The news of Frank Robinson’s passing is very sad to me, obviously. Even though we knew he was ill that knowledge does not anesthetize us. I am going to be a guest on a radio talk show tomorrow in my hometown to talk about Frank. I really don’t know what I am going to say because words are simply inadequate. 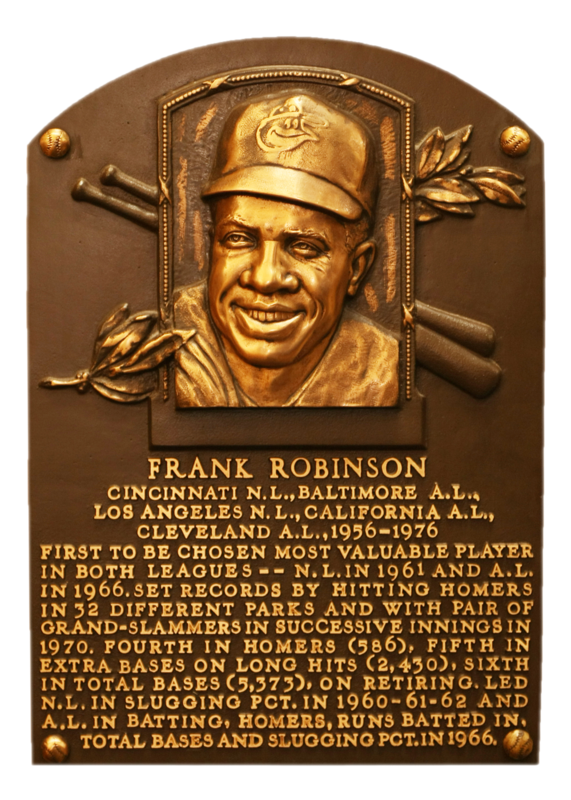 Here is a link to the post about Frank Robinson on his birthday last year. I will always be grateful for his counsel and his friendship. Unlike most baseball people of his generation Frank had an open mind about the use of statistics in baseball, despite some of the public comments he made while he was manager of the Nationals. I have many stories I could share, but perhaps a bit later. From baseballhall.org a picture of Frank’s Hall of Fame plaque. I am proud to have known him.